As a design-build turn key contractor, we are able to offer our customers a convenient one-stop, full-service means for procuring a building. We do it all. We design it using either the customer's architect or one we select, we formulate the cost, we obtain the permits, we schedule all materials and sub-trades, we assist with financing and land acquisition when required, and we manage all aspects of the project construction. Our complete full-service enables the customers to write checks to only one company ...Quality Steel Building, Inc. Larger companies tend to treat their customers like just another number. They lack that personal touch. QSB is large enough to handle any type of project. Our formula for success is simple: we select excellent people to work on a project and we manage it with great concern and attention to detail. Our goal is to deliver the best value in construction services at the most competitive cost. The History of Quality Steel Buildings, Inc.
Free Quotes on all pole barns, post-frame steel buildings, metal garages & steel frame structures. Serving Spokane & surrounding areas in the Northwest. Quality Steel Buildings, Inc. is dedicated to bringing you the building you want with the options you need at a fair price and competitive price. Our friendly, knowledgeable staff will do their best to make sure we meet your specific needs. Whether your looking for a post-frame metal pole building, an equestrian wood sided barn or a turn key all steel commercial project you've come to the right place. As the number one general contractor, we work hard to live up to our name. And that's a role were proud to fill. 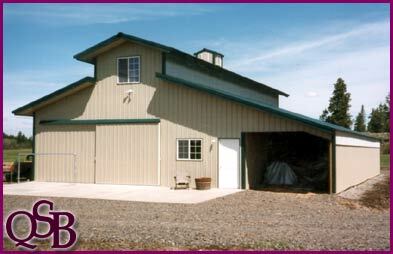 A few buildings styles we build: Metal Pole Barns, Post-Frame Steel Buildings, Equestrian Barns with Stalls, Agricultural Metal Hay Barns, Farm Shops, Commercial Shops, Shops with Lofts or Apartments, Garages (attached or detached) with matching siding, Airplane Hangers, Pole Building Homes and Turn Key Commercial Projects.